The sonnet is one of the most important and enduring poetic forms in all of European literature. First invented by Italian poets in the thirteenth century, the sonnet would become one of the most important poetic forms during the Florentine Renaissance, when such timeless poets as Dante Alighieri and Petrarch would utilize the form to masterful effect. Following the Renaissance the sonnet would become widely popular in other Romance-speaking languages such as French and Spanish; however, it would be several centuries before the form would enter into English literature, where it has flourished ever since. Consisting of 14 rhymed lines broken into either two or four stanzas, the sonnet is a deceptively simple form that has become renowned for its elegance and tremendous power when utilized to its full potential. The Italian (sometimes called "Petrarchan") sonnet was probably invented by Giacomo da Lentini, head of the Sicilian school under Frederick II. Guittone d'Arezzo rediscovered it and brought it to Tuscany where he adapted it to his language when he founded the Neo-Sicilian School (1235–1294). He wrote almost three hundred sonnets. 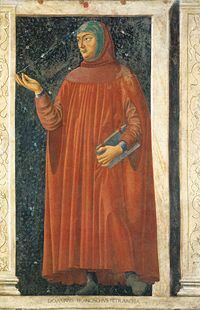 Other Italian poets of the time, including Dante Alighieri (1265–1321) and Guido Cavalcanti (c. 1250–1300) wrote sonnets, but the most famous early sonneteer was Francesco Petrarca (Petrarch) (1304–1374). The Italian sonnet was divided into an octave, a stanza of eight lines, which stated a proposition or a problem, followed by a sestet, a stanza of six lines, which provided a resolution, with a clear break between the two stanzas. Typically, the ninth line created a "turn" or volta, which signaled the move from proposition to resolution. Even in sonnets that don't strictly follow the problem/resolution structure, the ninth line still often marks a "turn" by signaling a change in the tone, mood, or stance of the poem. In the sonnets of Giacomo da Lentini, the octave rhymed "a-b-a-b, a-b-a-b"; later, the "a-b-b-a, a-b-b-a" pattern became the standard for Italian Sonnets. For the sestet there were two different possibilities, "c-d-e-c-d-e" and "c-d-c-c-d-c." In time, other variants on this rhyming scheme were introduced. In addition to the rhyme scheme, English poets usually use iambic pentameter to structure their sonnets as Milton has done here. This is a rough equivalent to the hendecasyllables or Alexandrines usually used for Petrarchan sonnets in Romance languages such as Italian, French and Spanish. The sonnet was introduced into English by Sir Thomas Wyatt in the early sixteenth century. His sonnets and those of his contemporary Henry Howard, Earl of Surrey were chiefly translations from the Italian of Petrarch and the French of Pierre de Ronsard and others. While Wyatt introduced the sonnet into English, it was Surrey who gave them the rhyme scheme, meter, and division into quatrains that now characterizes the English sonnet. Sir Philip Sidney's sequence Astrophil and Stella (1591) started a tremendous vogue for sonnet sequences: the next two decades saw sonnet sequences by William Shakespeare, Edmund Spenser, Michael Drayton, Samuel Daniel, Fulke Greville, William Drummond of Hawthornden, and many others. These sonnets were all essentially inspired by the Petrarchan tradition, and generally treat of the poet's love for some woman; the exception is Shakespeare's sequence. In the seventeenth century, the sonnet was adapted to other purposes, with John Donne and George Herbert writing religious sonnets, and John Milton using the sonnet as a general meditative poem. Both the Shakespearean and Petrarchan rhyme schemes were popular throughout this period, as well as many variants. The fashion for the sonnet went out with the Restoration, and hardly any sonnets were written between 1670 and Wordsworth's time. However, sonnets came back strongly with the French Revolution. Wordsworth himself wrote several sonnets, of which the best-known are "The world is too much with us" and the sonnet to Milton; his sonnets were essentially modeled on Milton's. John Keats and Percy Bysshe Shelley also wrote major sonnets; Keats's sonnets used formal and rhetorical patterns inspired partly by Shakespeare, and Shelley innovated radically, creating his own rhyme scheme for the sonnet "Ozymandias." Sonnets were written throughout the nineteenth century, but, apart from Elizabeth Barrett Browning's Sonnets from the Portuguese and the sonnets of Dante Gabriel Rossetti, there were few successful traditional sonnets. Gerard Manley Hopkins wrote several major sonnets, often in sprung rhythm, of which the greatest is "The Windhover," and also several sonnet variants such as the 10-1/2 line "curdled sonnet" "Pied Beauty" and the 24-line "That Nature is a Heraclitean Fire." By the end of the nineteenth century, the sonnet had been adapted into a general-purpose form of great flexibility. This flexibility was extended even further in the twentieth century. Among the major poets of the early Modernist period, Robert Frost, Edna St. Vincent Millay and E. E. Cummings all used the sonnet regularly. William Butler Yeats wrote the major sonnet Leda and the Swan, which used half rhymes. Wilfred Owen's sonnet Anthem for Doomed Youth was another major and tremendously dark sonnet of the early twentieth century. W. H. Auden wrote two sonnet sequences and several other sonnets throughout his career, and widened the range of English-language rhyme-schemes considerably; Auden is often credited for introducing a number of the techniques of slant rhyme into English poetry through his sonnet sequences. Auden also wrote one of the first unrhymed sonnets in English, "The Secret Agent" (1928). Half-rhymed, unrhymed, and even unmetrical sonnets have been very popular since 1950; perhaps the best works in the genre are John Berryman's Sonnets and Seamus Heaney's Clearances, both of which use half rhymes and unmetrical lines to powerful effect. Soon after the introduction of the Italian sonnet, English poets began to develop a fully native form. These poets included Sir Philip Sidney, Michael Drayton, Samuel Daniel, the Earl of Surrey's nephew Edward de Vere, 17th Earl of Oxford and William Shakespeare. 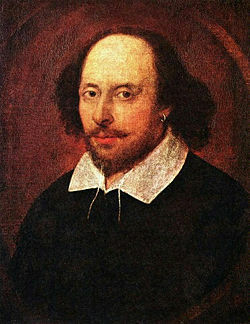 The form is often named after Shakespeare, not because he was the first to write in this form but because he became its most famous practitioner. The form consists of three quatrains and a couplet, in contrast to the Italian form of one octave and one sestet. The couplet generally introduced an unexpected sharp thematic or imagistic "turn." The usual rhyme scheme was "a-b-a-b, c-d-c-d, e-f-e-f, g-g."
Like captives trembling at the victor's sight. Written with tears in heart's close bleeding book. My soul's long lacked food, my heaven's bliss. All links retrieved October 12, 2015. This page was last modified on 12 October 2015, at 16:45.